“Might please Morrissey fans but who else is ever going to bother with it?” Edward Porter Sunday Times 6th August 2017. This was not an uncommon verdict of the new Morrissey biopic by Mark Gill released last week. The general sense from the reviews I read was that the film was a good natured solid piece of work with a very strong performance from Jack Lowden as our hero. However the consensus seemed to be that you would have to be a fan to really enjoy it. To test this theory I forced my long suffering Smiths and Morrissey hating wife along to give me a balanced view and my ardent Morrissey fan daughter to give balance. The conclusion of both my erstwhile reviewers was that the film was funny, moving and intriguing. It made both laugh and cry at least once. My partner completely lost the idea that it was about Morrissey and felt for the young dreamer trying to find their place in the world. This is the point that the reviewers miss, the film is a story of someone who thinks differently and believes they have talent but can’t see how to express themselves whilst being crippled by shyness and doubt. Hell, its why X factor and the voice are on every Saturday night. We see Morrissey feeling driven to write constantly but not being clear whether these are songs, poems or a novel and settling for getting short reviews published in the NME. Then singing alone in his bedroom whilst being too shy to even talk to a potential band member. The film gets behind that tension and shows that stark reality faced by so many people that dreams have to be compromised with the real world of employment, debt and relationships. Whom for all the magic in their heads they work with people who have little interest in them apart for someone to be the but of their jokes. The tough and stark environment of working class 1970s Britain is done brilliantly both in environment and culture. However the key to a he films genius is the portrayal of the central character. This was described by radio 5 as “just a pain in the arse” but I though he captured what I have long felt about Morrissey in that he is a very funny character. Full of gangling incompetence for anything practical and seemingly unable to see the positive side of anything. He reminded me of Woody Allen. When he expressed his thoughts he was generally incomprehensible to others and in one great line that captures this a colleague says “you sound posh are you from Bolton?”. There are problems with the film and it has been suggested that a film about the birth of or the death of the Smiths would be very exciting or a more gritty piece of the battle artistic acceptance of working class youth of the time would also be great but that ignores the great qualities of the film itself. I also worried that the end of the film lacked a dramatic climax and it does, albeit the ending is enigmatically satisfying. 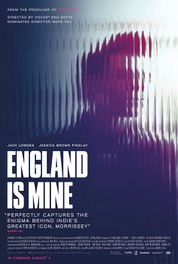 Posted by rebelrikkit on August 18, 2017 in Blog posts, film review and tagged england is mine, england is mine film review, film review, morrissey, the smiths.